Introducing Paper Addicts - the new papercraft brand from Trimcraft featuring fun, stylish and contemporary designs, and cool colours. We’ve got six new and amazing paper pads for you to take a look at… we just know that you are going to love these! Each paper pad is available in three sizes: 12” x 12”, 6” x 6” and 10cm x 10cm (the perfect size for die cutting)! Pet lovers, we have the purr-fect paper pad for you! With the cutest dogs, kitties, and paw prints (among other adorable patterns) and a super cool colour scheme, you will have lots of fun with this contemporary pad – fur sure! Next up, we have the nautical-inspired Ahoy There papers. The pink, blue and navy colour scheme is perfect for almost every occasion and with the adorable detail, you’ll be sure to create some memorable crafts. How about brightening up your papercrafts with the Colour Pop paper pad! The perfect addition to any project, this pad will help you to add a vibrant, decorative touch to your makes. Or you can add intrigue to your papercrafts with the Mandala Dreams paper pad! Illustrated with lots of delicate mandala-inspired patterns in a chic, monochrome colour palette, these sheets will be ideal for card making, die cutting, scrapbooking, and more! How about adding lots of delicate, woodland-inspired designs to your makes with the Lost Forest papers? Perfect for any occasion, these decorative papers are adorned with magical illustrations, including stags, bears, and woodland leaves. Or why not introduce beautiful, tropical detail to your papercrafts with the Let’s Flamingle Paper Pad?! For a whole range of occasions, these pastel papers are adorned with flamingos, tropical flowers, palm leaves, and delicate repeat patterns. 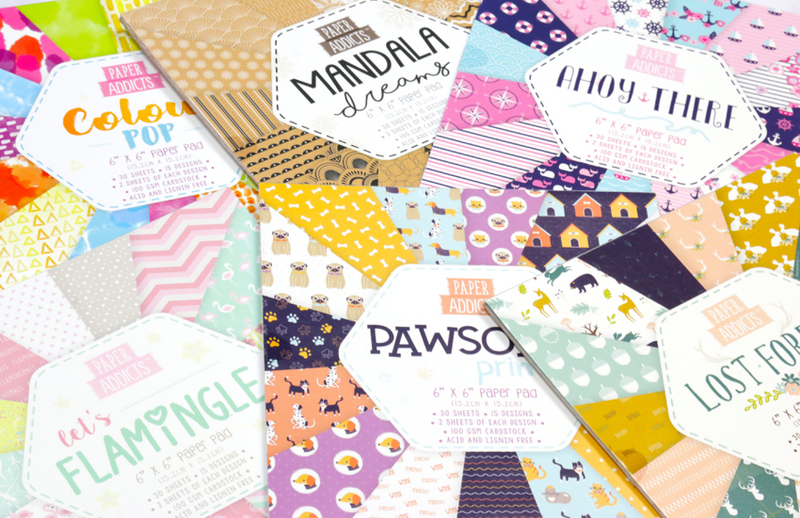 Now that we’ve shown you all of these amazing new paper pads, we’d love to know - which is your favourite? Don’t forget to let us know your thoughts in the comments box below and keep your eyes peeled in stores over the next few weeks to pick up your own. These all look wonderful and a lot of them will suit sets of the First Edition dies. The cat and dog sets, Nautical, and the nature sets. Wow such a variety of designs and themes, I can see each and every pad being very useful and inspiring, and yes I think I NEED them ALL!! Fabulous set of pads!!! Love em!!! They look great; can't wait to see those in the shops. Oh wow! Love the Pawsome prints and Ahoy There the best. Fabulous designs and colours.